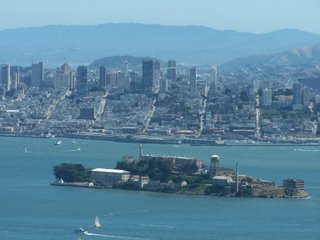 Everyone knows about Alcatraz, but just behind it in San Francisco Bay sits the much larger Angel Island. Formerly a military installation and now a California State Park, Angel Island is basically a mountain that rises 781 feet above sea level and on a clear day offers without question the most amazing views in the entire Bay Area. The weather in the city was great all weekend and fog season is coming soon so I decided to go out to Angel Island on Sunday for a bike & hike. This had been on my list for a long time, and although I had been out there a few years ago I only hiked to the top that day. Sunday I was excited to bring my mountain bike and explore more of the island on bike as well as on foot. 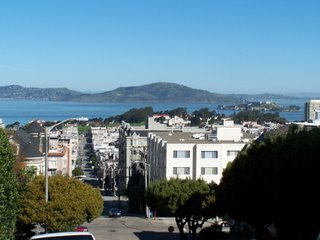 The weather was as good as it gets in SF - sunny & warm, 75 degrees and a nice seabreeze. The island is only accessible via ferry, and instead of catching the ferry from Fisherman's Wharf I decided to drive over the Golden Gate and out to Tiburon and catch the ferry from there. After grabbing lunch from the corner store/deli, and shattering my career high for filling up my car with gas to the tune of a whopping $53 I was on my way. $3.29 a gallon is no joke for my Maxima - I can't imagine what the SUV drivers of the world are shelling out. Later I thought to myself: will I be looking back 3 years from now and fantasizing about $53 tanks of gas? Probably. Anyhow, drove over to Tiburon, parked, and made it down to the docks. 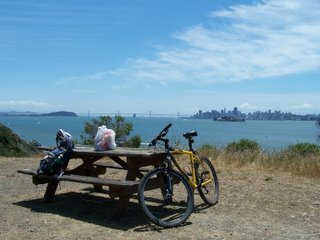 $10.25 gets you round trip ferry fare and pays your state park admission, and another $1 gets your bike on board as well. 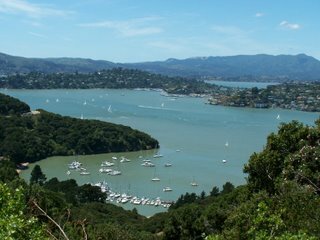 I caught the 12:00 p.m. ferry, and just had to make sure that I caught the last ferry back to Tiburon at 5:20 p.m., because if you miss this one then you are stuck on the island overnight. I set the timer on my watch and I was on my way. There is a 5 mile perimeter road that winds around the outside of the island, so I started off my trip by riding around this on my bike, stopping to take pictures, eat some lunch, enjoy the stunning views, or read the signs detailing the history of the island, much of it military. 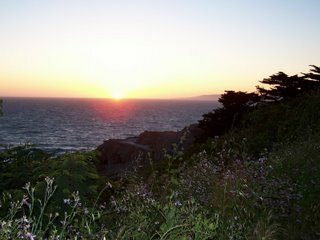 After this I went off the paved road and biked up onto a fire road that circles the mountain about halfway up. 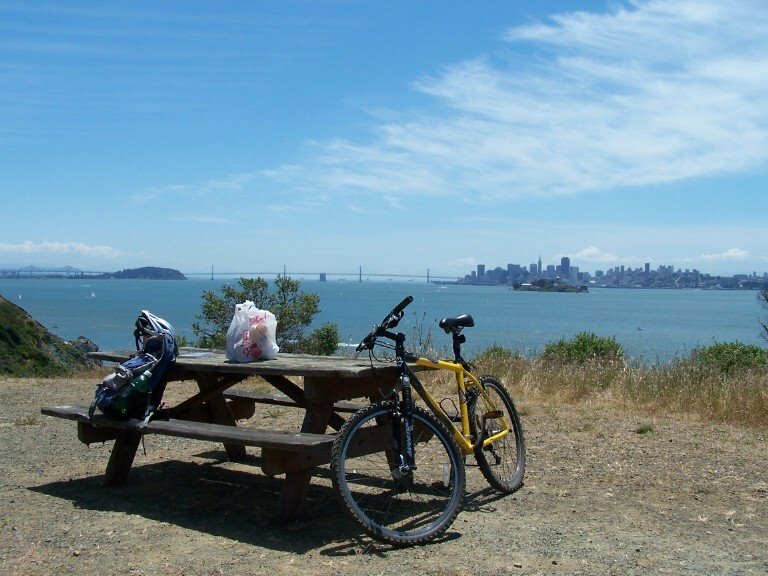 At one point there is a bike rack where you can lock your bike and hike the rest of the way up to the top, but I wanted the full-on Clark Griswold experience, so I bypassed this, finished the mountain bike loop on the fire road, returned to the ferry dock, and locked my bike there. Then I began the 2.2 mile hike to the top of the mountian, where I stayed for an hour before returning down another trail just in time to catch the last ferry back. 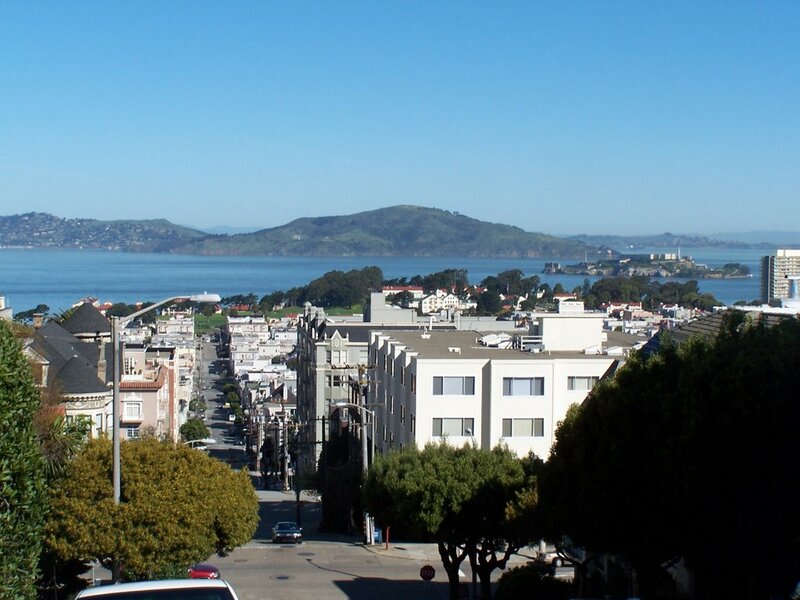 The views from just about everywhere on the island are amazing, since it is located right in the middle of SF Bay, but the 360 panoramic view from the top of the mountain is absolutely stunning. It's almost too much, and like a 5 year old child at Chuck E. Cheese on a Saturday evening, the possibility of overstimulation is significant. 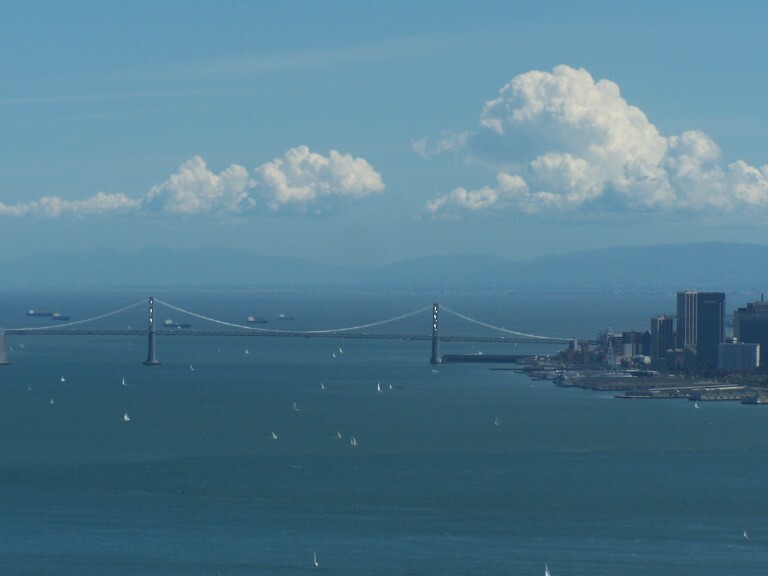 Standing on the summit and turning counterclockwise, you have a great view of the Golden Gate Bridge, Lands End, San Francisco peninsula, Alcatraz, downtown SF, the Bay Bridge, Treasure Island, Oakland, Berkeley, East Bay, Mt. 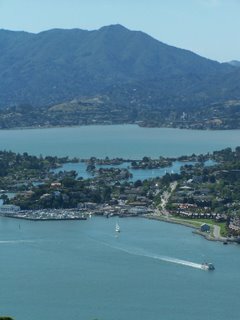 Diablo, San Rafael Bridge, Tiburon, Mt. 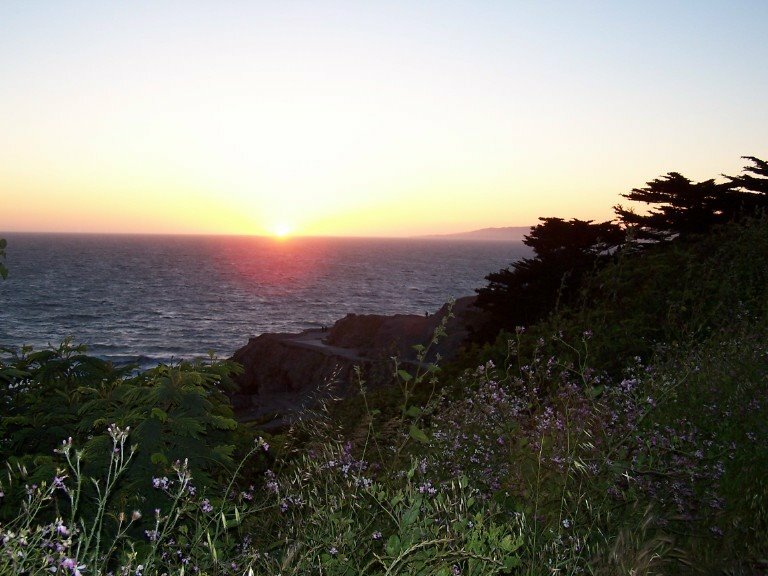 Tam, Belvedere Isalnd, Sausalito, the Marin headlands, and back to the Golden Gate. 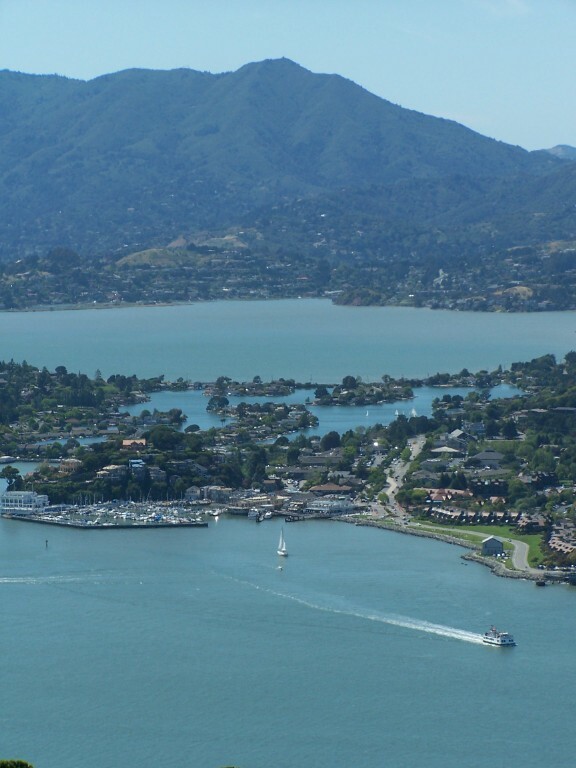 You also have great views of the bay itself, and all of the various boats, from sailboats to giant cargo vessels headed to and from the Far East. It's just incredible - if you ever get the chance to go then I cannot recommend it enough. 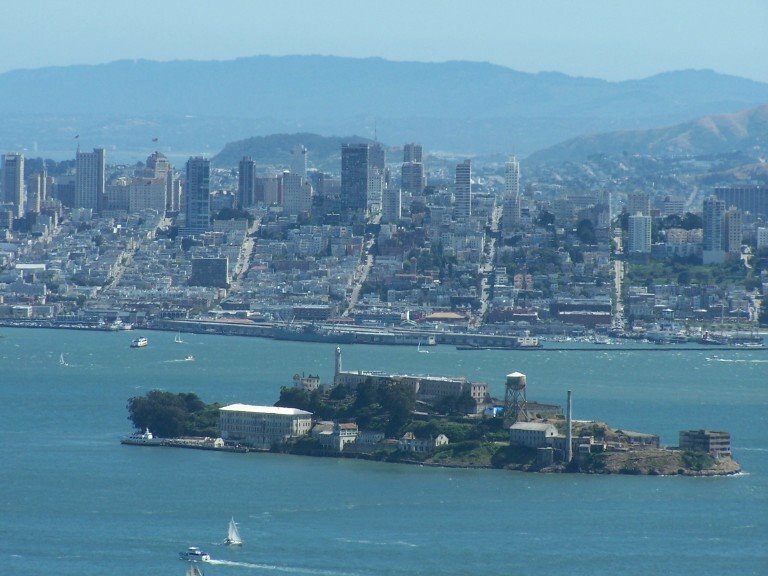 My recommendation for out of towners is if the weather is not great then go to Alcatraz, but if the weather is great then go to Angel Island instead. Got back to the car before 6, drove around Belvedere Island to see how the other half 0.0001% live, then drove back to the city and out to Lands End/Cliff House to catch the sunset, which was really nice despite it being unbelieveably windy out there. 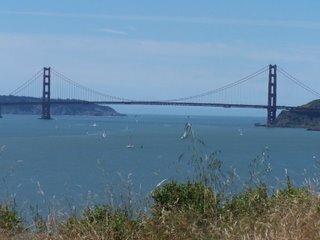 A great day, and I hope to go back out to Angel Island more often than once every 3 years. Monday was great too. 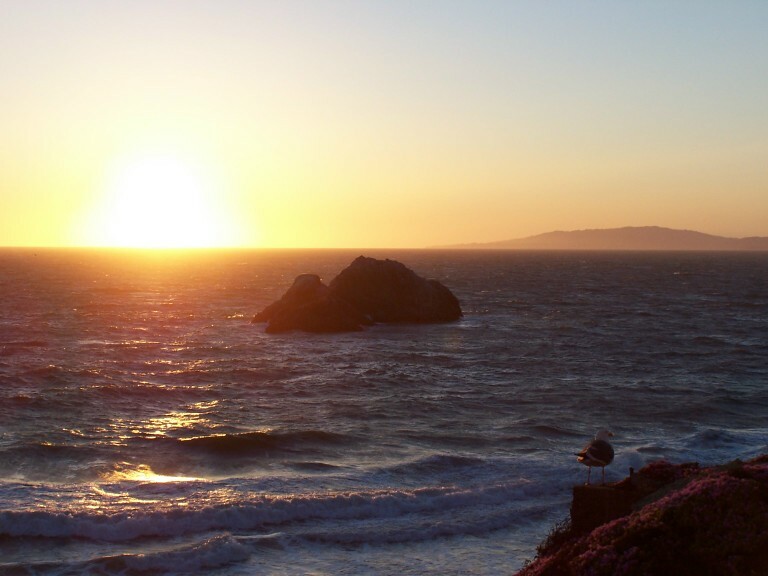 The weather was beautiful again. I drove up to Sacramento and got to do three of my favorite things: play golf, eat Chick-Fil-A/drink real sweet tea, and visit with my sister and her family. Thank you Truett Cathy for being open on Memorial Day; I thought you would be closed like you are on Sundays. Lord's Day 1, Memorial Day 0 I guess. Either way, it worked out great. I hope that y'all had a great weekend as well.